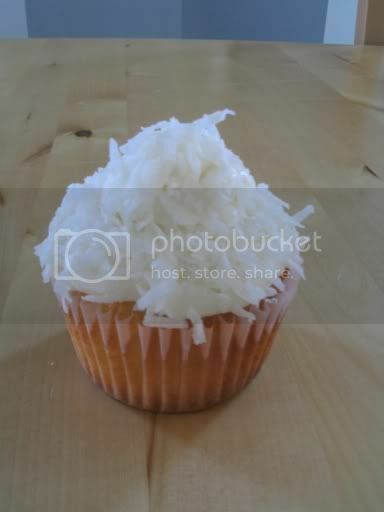 Cupcake, my love: Friend in need! It's 12:30 in the morning and my best friend is in hysterics! Her and her boyfriend (of 3 years) just broke up and she desperately needed someone to talk to. The second we hung up I knew that I needed to make my dear friend Annmarie a "Hate Your Boyfriend" dessert. I immediately started looking around for a recipe. I knew I wanted to make something chocolaty, because chocolate is definitely recommended in relieving the pain of a broken heart, but I didn't know what kind of chocolate item I wanted to make...until I saw it! This glorious masterpiece came is thanks in part to Peabody and it's called "Chocolate Crunch Slice". 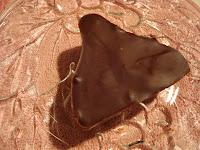 This is the richest, most decadent "get over your boyfriend" piece of chocolate you will ever have! It's basically melted chocolate, cream, butter and Oreos! How easy is that? 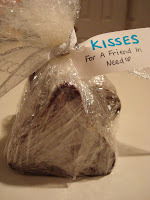 And since I wanted to show my compassion for my totally amazing friend I decided to put my chocolate slice in some Hesrhey Kisses molds that I've had lying around in my cupboard. These Kisses will totally knock your socks off! 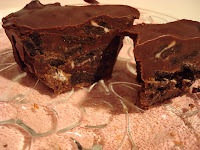 Peabody's recipe called for dark chocolate but I used milk chocolate, and they were still very, very rich, but oh so satisfying. (Eating these are great post break up or pre-period, but not recommended before a dentist appointment :0) ). And they're such a cinch to make, how could you not want to try them? In giving this to my friend, I just wanted her to know how much I care about her and that she truly deserves the most scrumptious kisses everyday, so forget the dumbie that let her go and look forward to the real Mr. Right, because I know he's out there for her! So to all those girls out there looking for love, don't give up...have a kiss! That is so sweet that you made these for her. She is the luckiest gal to have a great, supportive friend like you. you are the best friend a gal can have! moral support and chocolate.. does it get any better than that??? That's so cute! I wish my friends baked me stuff at 12 am, specially if it was that!